In this town, you're either one or the other. A young woman seeks to avenge her father's death at the annual gunfighter's tournament in the ghostly town called Redemption, where an outlaw named Herod rules with a brutal, calculating precision. The film is set on the town's one dusty street as one fighter after another is fatally eliminated from the ranks until only two fighters remain: the young woman, and Herod, her father's killer. Back before he became an “A”-list director with the Spider-Man movies, Sam Raimi was best known as the guy behind the crazy Evil Dead horror flicks. Raimi attempts other genres, however, and took on Westerns with 1995’s The Quick and the Dead. Rugged frontierswoman named Ellen (Sharon Stone) enters the lawless town of Redemption in search of revenge. Though intent on her mission, she becomes involved in the town’s big Quick Draw Competition. 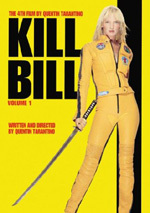 There she faces off against contestants like cocky young Kid (Leonardo DiCaprio), reformed gunslinger Reverend Cort (Russell Crowe) and flamboyant Ace (Lance Henriksen). While this occurs, she pursues her vendetta against John Herod (Gene Hackman), another shooter and the root of much of the town’s evil. Wow – it’s been so long since the release of Quick that I forgot Stone actually starred in the movie! If you look at the Blu-ray’s cover, you’ll think that Stone is just part of an ensemble cast and not the lead. That’s because Crowe and DiCaprio have become major stars since 1995, while Stone has lost her prior luster. Not that she does anything to embarrass herself here. I’m not sure Stone really seems right for this part, as I think she’s more suited to femme fatale roles. Nonetheless, she invests her character with a good sense of humanity and she can still pull off the requisite level of toughness. Someone like Kathleen Turner might’ve been a little stronger, but Stone proves more than satisfactory. It helps that she finds herself among a terrific supporting cast. While Hackman essentially plays a reprise of his Unforgiven character, he remains a delight to watch. Then on the cusp of stardom, DiCaprio reminds us why he seemed destined to become a household name, as he contributes a nice sense of heart to his generally one-dimensional character. Crowe also does good work with an underdeveloped character and brings out a lot of personality without much script support behind him. It’s somewhat amazing to see how much the various actors do with the characters since only Ellen receives any legitimate exposition. With the others, the script hints at backstories; it’ll tell us a significant event or two and force us to assume the rest. Or more accurately, it forces the actors to flesh out the rest via their performances, which they all do. This isn’t the kind of movie one looks to for fine acting, but I think we get a lot of above average performances, and they all give the film more substance than I’d expect. Raimi also manages to squeeze a surprising amount of tension from a structure that should become tedious. After all, the majority of the drama stems from the shootouts, and those are obviously repetitive in nature. Nonetheless, Raimi milks each one for all its worth; despite the predictable nature of much of the plot, we find ourselves worked up for each of the fights, and they prove to be genuinely exciting. All of these factors contribute to the film’s success. Quick didn’t find much of an audience back in 1995, but that doesn’t reflect on its qualities. The movie offers an interesting take on the Western genre. 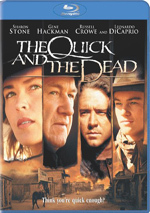 The Quick and the Dead appears in an aspect ratio of approximately 1.85:1 on this Blu-Ray Disc. Though inconsistent, the transfer usually satisfied. My biggest complaint related to sharpness. While most of the movie exhibited good – and occasionally great – definition, more than a few soft shots cropped up along the way. These weren’t enough to spoil the rest of the film, but they did cause some distractions. No issues with shimmering or jaggies interfered, and edge enhancement remained minimal. As for source flaws, I noticed a handful of small specks but nothing major. Like most Westerns, Quick went with a dusty palette. A moderate reddish tint occasionally added warmth to the image, but the flick usually stayed with the standard arid sensibility. Across the board, the colors looked positive given their design restrictions. Blacks were dark and dense, while shadows showed generally good clarity and visibility; a few low-light scenes seemed slightly thick, but not to a great degree. The softness almost made this a “B-“, but I thought the film looked good enough for a “B”. I awarded the same grade to the Dolby TrueHD 5.1 soundtrack of Quick, which came as a surprise. Given the nature of the story and all its action, I expected something livelier and more involving. Don’t get me wrong: the movie offered some good segments that used the five channels in a vivid way. These were just the exception more than they were the rule, and that was the surprise. Nonetheless, the soundfield was reasonably satisfying. Music boasted nice stereo definition, while effects spread to the sides and the rears in a convincing manner. Only a few scenes really brought the track to life, but there was enough action here to provide a good soundscape. Audio quality was also perfectly satisfactory. Effects showed nice range and heft, though a bit of distortion marred some louder scenes. Music was bright and vivid, and speech seemed well-reproduced. The lines showed good clarity and concision throughout the film. Though the soundfield wasn’t ambitious enough for a really high grade, it still worked well enough for a “B”. A few ads appear in the Previews domain. We get promos for The Da Vinci Code, Casino Royale, Ghostbusteres, A River Runs Through It, Damages Season One, The Sky Crawlers, Sugar, Rudo Y Cursi and Tyson. No trailer for Quick shows up here. One additional comment about the supplements: the Blu-ray’s case mentions a feature called “movieIQ”. This sounds like a running, interactive component. Unfortunately, it requires BD Live to access it. My player lacks that connection, so I can’t comment on its contents – or include “movieIQ” in my supplements grade. If you have BD Live, you’ll probably be more pleased with the extras than I was. At its heart, The Quick and the Dead sounds like some kid’s silly fantasy of a movie: “It’s like High Noon but just the ending!” While that premise easily could have faltered, it actually works well here, as the film keeps us interested and entertained. The Blu-ray offers generally good picture and audio but it skimps on extras. The lack of substantial supplements makes this one a tough “buy” recommendation, but I do like the movie enough to at least urge you to give it a rental.